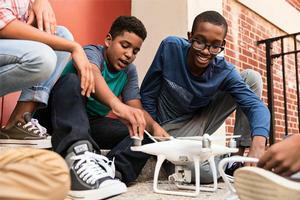 HAMPTON, Va. (May 30, 2018) — Middle school male students from Hampton City Schools will participate in a three-week program at Hampton University to immerse them in Science, Technology, Engineering and Math (STEM) activities, starting July 2, 2018, which will run until July 20, 2018. “It’s exciting that Verizon renewed this program for another two years, and it’s our honor to bring together our talented faculty with youth in our community who may not have access or the means to learn about STEM,” said Hampton University President, Dr. William R. Harvey. “I hope that programs like this will offer promising young students a leg up to ensure their futures are successful and full of dreams."